CEO Mark Zuckerberg opened the conference to talk about, the new Camera Effects of course! Zuckerberg went so far as to call it the first mainstream augmented reality platform (sorry Snapchat) – and it didn’t stop there. Adding on to the new Camera Effects update that rolled out 3 weeks ago, the tech giant told of its plans to expand the feature. “We’re offering a suite of creative tools to give our community of artists and developers the power to create a full spectrum of effects for the new Facebook camera, from simple photo frames to interactive effects and masks using the latest in augmented reality technologies” (Facebook). The extension of the Facebook Camera feature will include 2 products: Frames Studio and AR Studio. Frames Studio – does just that – it allows users to design frames that can be used as either profile picture frames or as filter frames in the Facebook Camera. AR Studio – this is where it gets interesting. Open for beta applications, this product can be used to create masks, scripted effects, animated frames and and other AR technologies that react to movement or interactions during Live Video. And that leads us directly into major announcement no. 2. 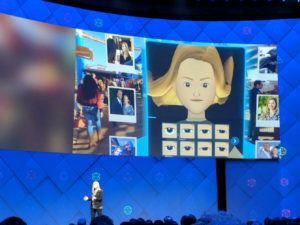 A new ‘social VR’ product that launched in beta for Occulus Rift today, allows users to design their own avatars and then “hang out” with up to three of their avatar friends in a digital world of their choosing. 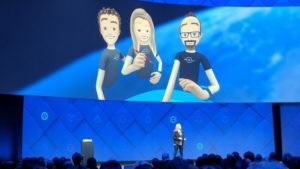 Facebook Spaces will also be integrated with Facebook Messenger, so once in a virtual space, the avatar can call Facebook friends through messenger and instantly invite them into their VR setting. “With Facebook Spaces you can view Facebook content with friends in VR, including 360 videos and photos that can transport you to new places. You can draw in the air with a virtual marker to create anything you can dream up” (Facebook). Discover Tab: allows users to find ‘information bots’ that can help keep them informed about real-time news, such as sporting events, economics, etc. Messenger’s AI Assistant, M: “offers the ability to order food through delivery.com. For instance, if you’re chatting with friends about what to grab for dinner, M will suggest placing an order. The whole experience can be completed in Messenger, including group ordering and payment” (Facebook). Smart Replies: help businesses respond to frequently asked questions – business hours, directions and contact details etc.